Whenever the USAC sprint car tour came to the Allentown Fair you could bet the best drivers in the country were serious about taking home the trophy. The local teams, however, were even more focused on victory than the travelers. In 1957 Boyertown, PA's Johnny Thomson drove Sam Traylor's #2 Offy powered sprinter to victory at Allentown on 9-21, his third win of the season. Thomson's teammate, Van Johnson, driving Traylor's #55 Offy, also swept three features on the eight-race eastern USAC schedule, but neither won the eastern championship. Traylor also failed to win the owners' championship. Incredibly, 'The Thin Man', Bill Randall of North Reading, MA took the eastern drivers' crown and, without benefit of a feature win, also won the '57 USAC eastern car owners' trophy for Edgar Stone of Belmont, MA. For 1958, Traylor sold his #55 to Ed Lowther of Cannonsburg, PA to concentrate on a single car effort to win the 1958 crown. 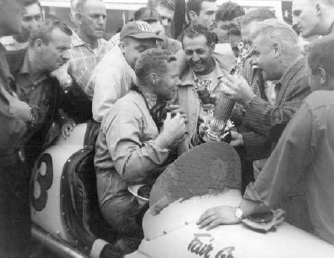 Van Johnson apparently was included in the deal and Lowther's car carried the #2 in '58, emblematic of the car's second place finish in '57 points. Thomson's Traylor sprinter would be numbered '3' in 1958 for the same reason. To kick off the 1958 season, Thomson took the opening eastern circuit 30-lapper at Williams Grove on April 13th. The Boyertown racer also won twice at Reading, a 20-lap main event on September 14 and a 50-lap affair on October 12th. While the Allentown race on September 20 was scheduled for only 20-laps, it remained a high-priority event for both Thomson and Traylor. 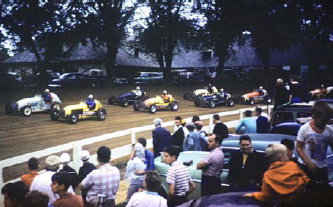 Parade lap at Allentown, 1958, 3 Thomson on pole, 4 Hinnershitz outside front row, 2 Johnson in 3rd, Jiggs Peters, 5th in the Fray Offy 78. Thomson scored four wins in seven of eight '58 events to grab the USAC eastern sprint car championship and secure the owners' title for Sam Traylor. The Traylor team passed on the pavement race at Thompson, CT on June 1, an event won by Joe Barzda in his California Speed & Sport injected Chevy #33, the first USAC win for a Chevy stock block powered sprinter. 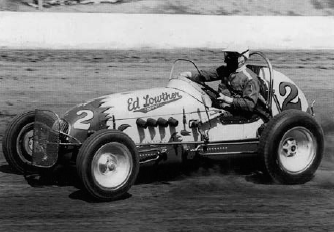 In 1958 eastern sprint car drivers also left their mark on USAC races in the midwest. Oley, PA's Tommy Hinnershitz posted his 100th sprint car feature win at Terre Haute, IN on August 17th and Center Valley, PA resident, Eddie Sachs raced all the midwest races, winning at Salem, IN twice, New Bremen, OH twice, and the spring race at Terre Haute to claim midwest titles for himself and owner, Bill Cheesman. The pair also won a 50-lap eastern race at Williams Grove on October 19 to put a period on their season. Your monetary sponsorship in any denomination or donations of historically significant items, photos, documents, etc. toward projects undertaken by the EARHS are welcomed and encouraged. EARHS is recognized as a federally tax exempt charity by the IRS under Section 501c(3). Wanted: Racing photo collections - share and preserve programs. If you have vintage racing photos, EARHS would like to be able to scan and copy these items. All items will be returned intact and we can provide you with a computer disc of those items from significant collections. 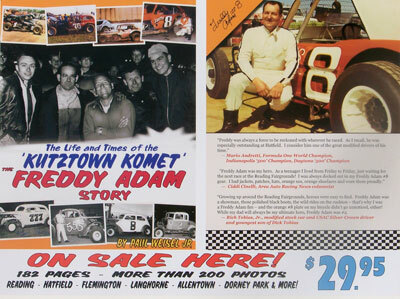 We are especially interested in Dorney Park items from the 1940's, 1950's, and 1960's and all Allentown Fair items, including indoor racing events, but all items are welcome. We continue to fill our showroom - all members are invited to visit and check our progress. Please call Pete (610 398-2188) or Paul (610 395-5303) to arrange a time to visit. In This Issue... Buster Warke lost to racing world, February 20, 2008 at age 93.